Is this Orange Lentil Soup or Stew? You be the judge! Its a recipe to turn dried orange lentils into a flavorful meal that needs no meat! Its a great recipe addition for those of you following Meatless Monday and should be included in your weekly menu plan rotation for sure! Lentils are rarely prepared in our culture, but be adventuresome and visit the bulk bin at your local market and try them. 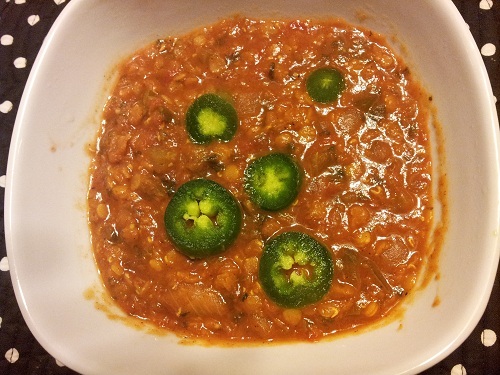 Lentils dont need to be soaked overnight, so they can be a last minute meal decision. You wont be disappointed and kids tend to love them, which is a plus! Rinse the lentils and add them to a pot with the water and bring to a boil. Reduce the temperature and simmer them. Stir fry the jalapeno pepper, green pepper, celery, onion, and garlic in oil, until nicely browned. Add to the soup mix, along with the tomatoes, and seasonings. 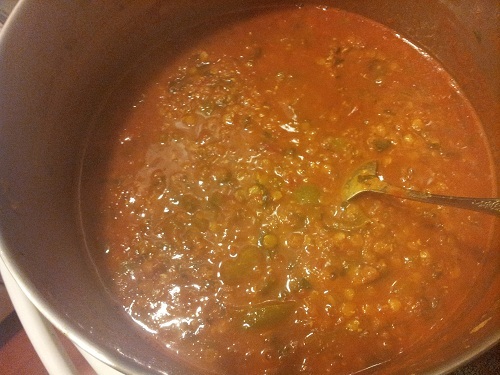 Continue to simmer until the lentils are done, which can vary from 1/2 an hour to an hour. If the soup seems too dry, add more water. Stir occasionally to prevent the lentils from sticking to the bottom of the pan. Before serving add chopped cilantro and the juice of one lemon. Serve extra cilantro on top of each bowl of soup and lemon wedges for those that want more lemon!